I published already several blogposts on this blog analyzing the Twitosphere is several European and South American countries (see the sidebar). The next country analyzed is Canada. Using the same approach as for the previous countries, I managed to find 3307 active Twitter accounts from Canada. A Twitter account was considered to be held by someone from Canada if the location explicitely refers to Canada or if the Twitter user was located in Canada according to one of the Twitter mapping mashups. The actual number of Canadian Twitter users is probably higher as only 50% of the Twitter users specify their location in their profile (see this previous post). For a population of 33.126 million people (according to Wikipedia), Canada has 3307 Twitter accounts, meaning that there is a Canadian Twitter account for every 10,014 inhabitants. Currently for Iceland and the Netherlands there is one Twitter account for less then 10,000 inhabitants. This graph below shows the history of the Canadian Twitter accounts. The graph is based on the date of the first message posted on each of the public Canadian Twitter accounts. Only 234 Twitter acounts from Canada or 7.1% have chosen to keep their updates only available to their friends. In the analyzed European countries this percentage varied from 3.5% (Italy) to 22% (Belgium). A Twitter user can choose to follow one or more other Twitter accounts, called "following". 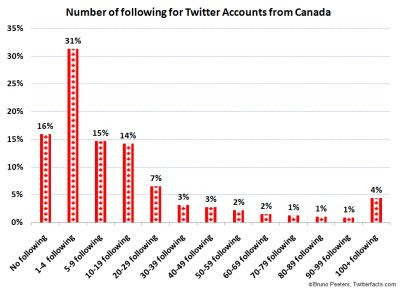 16% of the Canadian Twitter accounts do not follow other Twitter users. 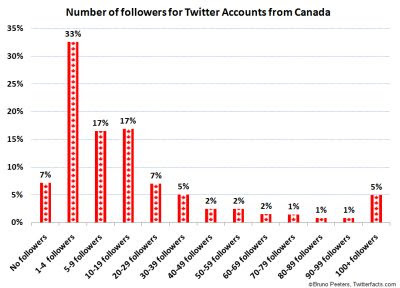 An average Twitter account from Canada follows 23 Twitter accounts. In the analyzed European countries this average varied from 9.6 (Belgium) to 32 (Italy). A follower is someone who has indicated another Twitter account as following and receives all updates of that other Twitter account. 7% of the accounts have no Twitter followers at all, meaning that no one else on Twitter has indicated this account as following. An average Twitter account from Canada has 25 followers. This average is in line with the averages observed for the European countries : between 10.5 (Belgium) to 26 (Italy). Only 3% of the accounts from Canada are still waiting for their first update to be published. Currently an average Twitter account from Canada has 188 updates, which is higher than the averages observed for the European countries from 72 (Belgium) to 106 (Italy and Spain). The analysis for the European countries was done several months ago. The averages have probably increased by now. The relatively high average number of updates can be explained by several very active Twitter accounts. Some of them are from a human twitterer, others however are from an automated source. 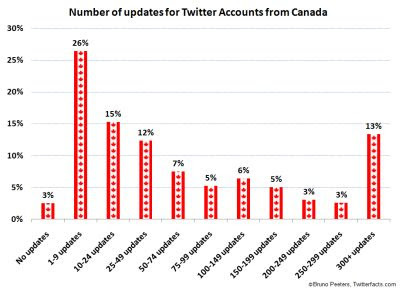 50% of the Twitter users in Canada had less then 34 updates. 46% of all Twitter accounts from Canada with a public feed did not post an update in the last 30 days. They can perhaps be considered as inactive accounts. 38% of all Twitter accounts from Canada with a public feed did post at least one message in the last 7 days, indicating that these accounts are still alive. This state of the Canadian Twitosphere is only a snapshot, meaning that the figures mentioned in this post have already changed because the Twitosphere is a very dynamic environment with several new accounts being created every day, new connections being made between accounts (following/followers) and of course new messages being written every hour of the day. 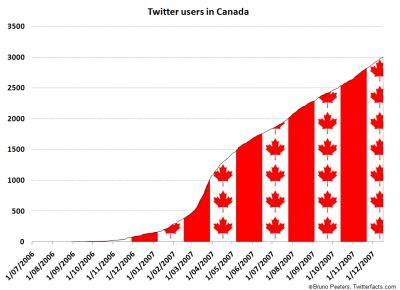 Users from Canada were among the first to start using Twitter (from July 2006). From November 2006 the number of users increased at an higher rate. From April 2007 the growth in the Canadian twitosphere accelerated further. The growth of new Twitter user accounts in Canada slowed a little bit down afterwards. Surprisingly the growth remained at the same speed from June 2007 until now. Thanks a lot for the info. I just started up Twitter yesterday. Have heard that it could help in Blog Traffic. Not quite sure how yet but I'm studying every angle. There's a guide I'm about to read on Caroline Middleborook's site as well as a lot of other blogosphere chat about it. Doesn't hurt to try. Bruce, as you post something substantial to your blog, also tell us about it on twitter with a link to the post. Shorten the URL with a tool like http://tinyurl.com or http://tweetl.com or http://urltea.com if you need to. The more followers you can build up, the more likely you are to increase traffic to your posts. Warning: you will need to post something of interest to people. That is the challenge! I will look for you on Twitter! Darn it. I got close to being the top twitterer... haha. It is a february ember. I'm looking forward to a higher adoption of Twitter in Canada now that all major carriers: Fido, Rogers, Bell, Telus, Koodo and Virgin Mobile allow SMS updates for their customers. I am very curious to see your state of the Twitosphere in 2009. I Am You Are You're Canada London England Welcome Welcomes You In At?